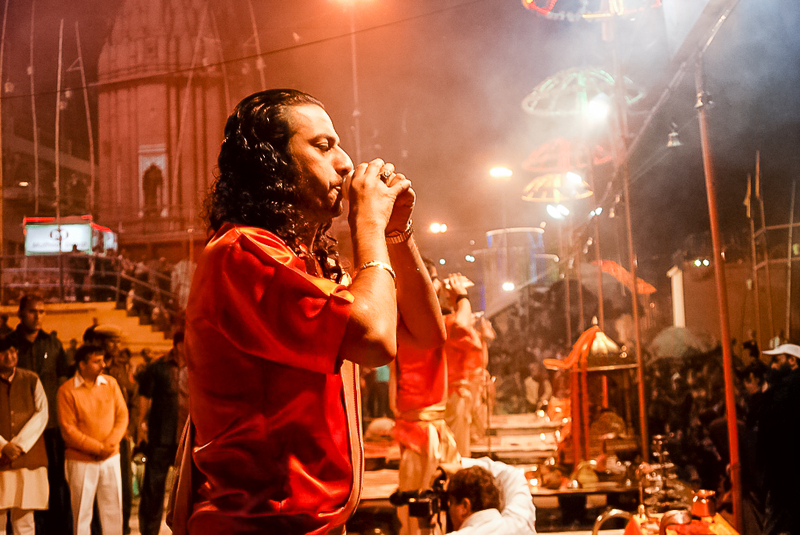 I went to Varanasi in search of Kashi – the oldest city in the world; where Lord Shiva himself whispers the mantras of salvation in the ears of a dying person. It is a dwelling of all gods, where every ghat has a mythology attached to it, a powerful kingdom mentioned in the Jataka tales, an old cup of tradition that made Mark Twain write –‘older than legend, older than tradition… older than all of these put together’. But the town I went in search of has shifted, mutated with the onslaught of centuries. It is said that ‘Varanasi soon grows into you and starts living with you’. The city is a cup of ‘essential hinduism’. For every visitor, this city dishes out a different offering. The gentle waters of the Ganges, the boat ride at sunrise, the array of shrines, the myriad temple spires, the palaces at the water’s edge strutting out as jewels in the overly crowded ghats, the ashrams (hermitages), the pavilions, the chanting of mantras, the fragrance of incense, the devotional hymns, finding right path in labyrinthines people call lanes, the road-side peddlers selling religious paintings and kitschy idols, malas and garlands, jewellery and toys and innumerable road side shops peddled on the steps to the holy Ganges – all offer a kind of mystifying experience unique to this city. You feel perplexed, at times disoriented and irritated with the way city moves; yet you get encharmed. At first it seems to be just another Indian city, with teeming crowd, vehemence of religion, sauce of culture, the inescapable squalor and dirt but still it attracts you which even the boulevards of Delhi, the night life of Mumbai, the joy and intimacy of Kolkata and the cuisine of Hyderabad cannot. I had my accommodation set in the Suryauday Haveli in the Sivala Ghat. It was a 15 minute boat ride upstream from the Assi Ghat along the famous ghats of Benaras to reach the Haveli. The Haveli built by the Royal Family of Nepal as a retreat for the aged, reflects the spirit of the city – old, preserved yet keeping up with tradition and time. My guide had arranged a tour of Ganga Aarti in the evening. And since it was Ganga Mahotsav and Kartik Poornima was just a day to go, he had cautioned me that I would not be able to see a single step on that day. Traditionally it is called ‘Dev Deepawali’ – a day when lords descend on Earth. It is a festival of 4 days starting with marriage of Goddess Tulsi celebrated as Jathwan Ekadashi. The day I had landed in the holy city is celebrated as a day when Lord Shiva invited Lord Vishnu to the city (you feel good being a guest that auspicious day). The fervor of the festival was in the air. The Ghats were all occupied as he had said. And it was not even evening!!! In the evening I made a move towards the ghats to watch Ganga Aarti. There are moments that always make your journey memorable – rowing a boat from Sivala ghat to Dashmashumedh ghat was that for me. I list that as ‘must to do in varanasi’ in my list. 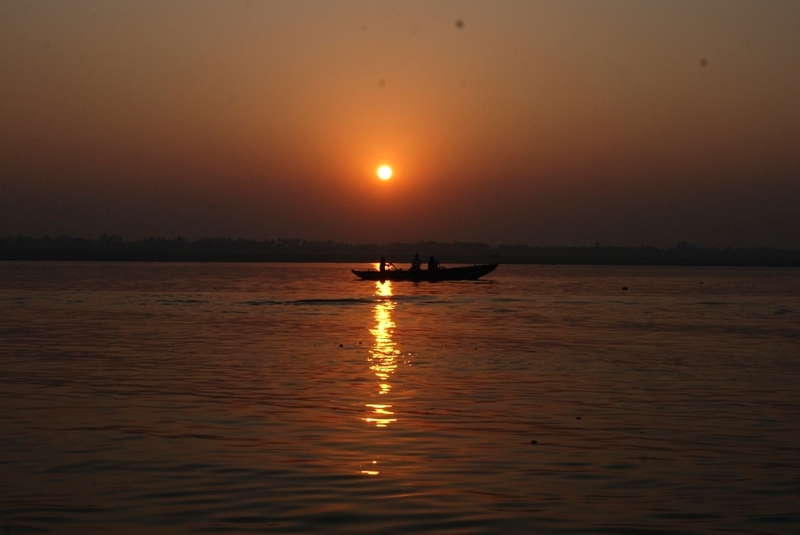 Varanasi is the only place where at a certain stretch Ganga flows south to north. This makes rowing a boat a tougher task in Varanasi. The next few moments were divine – words and phrases fall short to describe. The ghat was cleansed with holy waters of the Ganges. Hundreds of people had thronged, the devotional hymns were being recited over loudspeakers and priests were preparing for the Sandhya Aarti. Occasional lamps floated on the river waters. Within minutes the priests took their positions for the Aarti. ‘Sir this is the best thing about Varanasi’ my guide said. In minutes the flames become the most glaring light on the ghats. 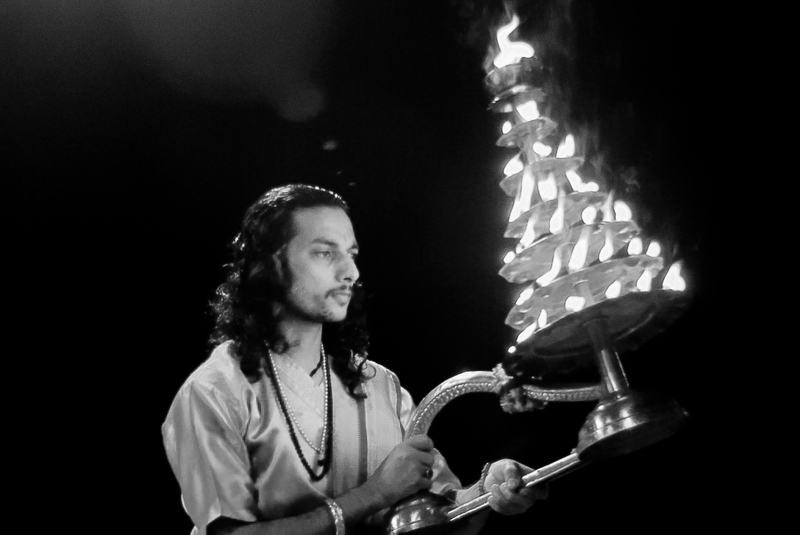 You can leave your cameras in a shoot mode and drench in this spiritual confluence as the mantras are read and aarti is performed in a rhythmic fashion. This sight is enough to make your day. The whole ghat was lit with lamps. 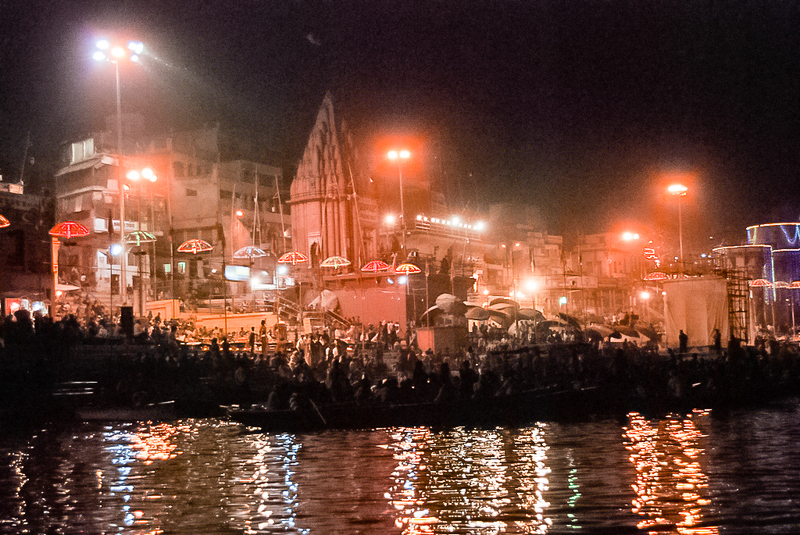 The brightly lit appeal of the ghat resonate the purest of the intentions with which devotees had come there. 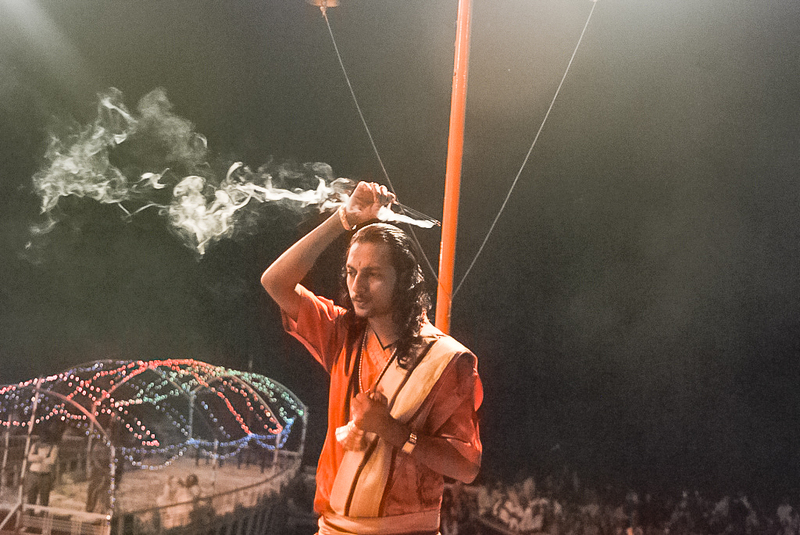 The Aarti went for over an hour, and I sat there mesmerized, my eyes unmoved. The next morning was gorgeous. The sun shone like a giant torch on a wintery sky, filtered by smoggy air. The ghats, transitioned from seats of devotion to ones smoked in funeral smokes, casted a spell. The river waters seemed to be absorbing everything in itself from flowers to half burned body parts. The devotion, spirituality, flow of the water is just incomprehensible. There are such 84 ghats in Varanasi; infact the city has got its name by combining the Varana ghat and the Asi ghat – the first and the last ghats of the city. The guide had planned the entire day for me – temple visits after breakfast, the ‘must do’s of varanasi’ (that was kept a surprise) and then the big thing – Dev deepawali. Luckily we had the pass to be there or else it becomes irrationally expensive. The boatmen ask for something like 10000 for a boat to take to the Dashwashumera ghat. The first on my list was the Kashi Vishwanath. Built by Devi Ahilya Holker in some 1700’s, the temple is one of the jyotirlingas. This set of the tour was to be covered on rickshaw and foot. Even the thought of being in the narrow alleys scared me. Varanasi lives in its lanes and ghats, my guide repeatedly said. We went to the Gadolia chowk and from there to the temple on foot. A small halt for the ‘elaichi maar –k chai’ with clouds of dust swept by the jamadaar in the vicinity was second happening on my way, (the first being landing on cow dung). Shops on both the sides blocked the little space that was left. It always gives a different feeling seeing such a big crowd thronged for ‘darshan’. I had that at Mahakaleshwar – Ujjain and now it was here. I was on a religious spree that day – had many temples on my list to visit. The crowd, the dust and holy cows; all seemed to be necessary elements on your way to attain nirvana. 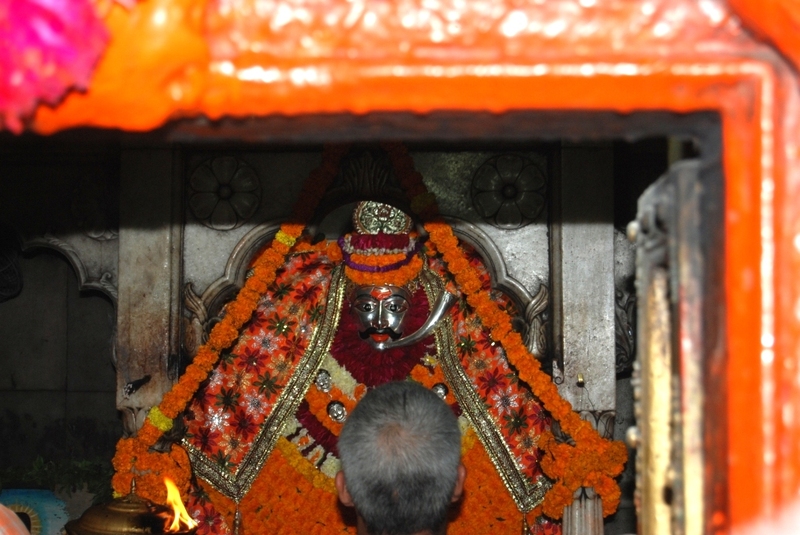 After Kashi Vishwanath, we headed for the Kedareshwar temple and then to Durga temple. There are numerous temples on the ghats. Uncountable actually. We had little time to spare for every temple and the list was huge. I was a little more excited to have the Varanasi surprise unfolded before me. He guided me towards the ghats again; a boat was waiting for us. Everything in the city seemed to be connected with the river. Our boat headed to the Ramnagar Fort. My guide told me that due to paucity of time, we wouldn’t be visiting the fort. The reason, he told me, for heading towards the fort was the ‘Ramnagar ki Lassi’ – the first must have of the city. So there we were to have the famous Ramnagar ki Lassi. Terracotta cup, heavy coat of thick malai and taste which I can only define as ‘orgasmic’ (I feel like associating this word to everything in Varanasi). It was literally a must have. No regrets spending more than an hour to have this. The next ‘must have’ was ‘banarasi silk’. We explored some wholesale shops in the ghats for shopping. Reluctantly I got a shawl for myself. The next on his list sounded addictive – lethi ke pakode or bhang ke pakode. I was indecisive about having them being concerned about the night aarti. ‘Areyy kuch nahi hoga sahab’ my guide assured and indecisively I had. It was so addictive that I got some packed for my night journey back to Delhi. And yes, the bold line ‘Kuch nahi hua’. I was on a day –out to see the colours of the city. My guide took me to an instrument shop. Instrument shop seemed ubiquitous in the city and you can sit there and listen to some fine music of the ‘Banarasi Gharana’. My guide stressed me to take a flute as a token of remembrance from there. I smilingly nodded at the thought and shelled some bucks. Next on the ‘must have in Varanasi’ list was an absolute desire – something that has become synonymous to the city – banarasi paan. Sinful yet delightful. This was the last on his ‘must have’ list. His ‘must have’ list has become mine too. These little bright colours of the city veneer its religious and cultural draping. But my purpose of coming to the city was still unresolved. I was eagerly waiting for the evening to set. Since I had a pass for myself, I could have afforded to reach late; but if you don’t have it, it is advisable to be there by 3 in the evening to be a witness to this celestial happening. I was there at five: the celebrations had already begun – a spectacle of lightning of a million lamps was awaiting me. The occasion marks the end of month long Kartik Mahotsav. It took just a few hours for millions of lamps to dot the stairs of the ghats and adjoining palatial buildings. An equal number of earthen lamps gingerly floated on the river. It was a spectacle to see and feel. It is believed that Gods descend on this day to bathe in the holy ganges. A strong aroma of incense filled the air. Coupled with chanting of vedic mantras, the million lamps reflected the religious fervor of the place. It was the illumination of truth, sanctity and spirituality. The sight made me believe Diana Eck’s words “Where this eternal light intersects the earth, it is known as Kashi (Varanasi)”. There was movement, motion, human life everywhere but all so beautifully draped. I was totally consumed in these kodak moments. The ghats were as busy as an ant hill – humans costumed in the golden aura of the lamps. I realized why this is called the ‘city of the living’. My trip to Varanasi taught me that colours of India cannot be prose or transmitted successfully. Even though the ghats can be captured in a walk of few hours, there is so much to charm even if one walks through the same stretch for weeks together. It is a city of odds; the filthiest I ever saw yet the most pious.